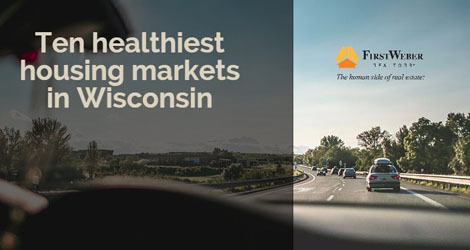 SmartAsset, a company which provides data based information on retirement, housing and investment, ranked the ten healthiest housing markets in Wisconsin based on factors that look at stability, affordability and risk of loss. Oshkosh Northwestern Media /The Northwestern recently posted an article based on the study and talked with First Weber’s Gail Schwab about the Oshkosh real estate market and its ranking of #6, stating that Oshkosh is a stable, predictable housing market. Her comments do indeed apply to all areas of Wisconsin, which is ideal because communities on SmartAssets list of the ten healthiest housing markets in Wisconsin are all over the state where First Weber sells homes. Click into the links above to learn about these top Wisconsin communities including real estate statistics, school data, properties for sale and nearby points of interest around each home. Contact your local First Weber agent to get started on buying or selling your home. Welcome to the First Weber Team. We make getting your Wisconsin real estate license easy!